What Are You? – This Moment! So, I sat down and watched “Peaceful Warrior ” a Lionsgate Films Production. But, unlike the other hundred times, I watched it… I took notes of all the one line lessons delivered in this movie and boy was it a huge list. 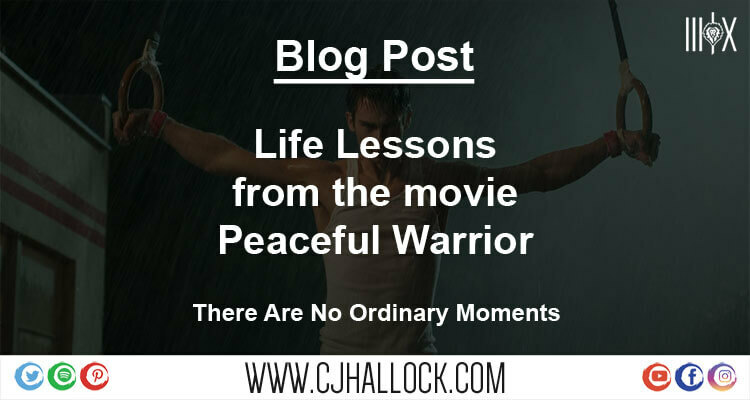 The Peaceful Warrior quotes I’m going to be sharing with you are my personal favorites and believe EVERYONE should know the lessons I’ve learned from them. A college gymnast “Dan Milman” (Mechlowicz) loses everything in a motorcycle accident and follows the teachings of a full-service gas station attendant “Socrates”(Nolte) to find peace within himself. I have watched this movie so many times I almost have the entire thing memorized. To be honest, after watching a scene from it last night on youtube I realized there are many lessons derived out of the quotes in this movie and wanted to share some of them with you. But, I couldn’t remember all of them so I sat down this time and with pen and paper and wrote almost all of them down so I can share them. It took me a while because there were times I had to pause and skip back on the DVD. I got about 2 pages of stuff to share so I hope you like it! In one of the opening scenes, Dan goes to a gas station and as he is leaving he turns to see Socrates, or Soc for short, sitting on a bench. He turns back around and takes a few more steps. When he turned around, Soc was on top of the building. Knowledge is different from wisdom…Wisdom is Doing! In this scene, Dan is at the gas station talking to Socrates while Soc is pumping gas for a customer. He’s trying to figure out how he got on top of the building. I’m not going to quote the entire scene, but I am going to spotlight some of the dialogue. “I know more than you think” Dan kind of started to show his cocky side. “You know how to clean a windshield? Wisdom is doing it” then Soc threw Dan the squeegee to clean the customer’s windshield. So the reason I love this quote and probably will put more into this than any other quote I reference is that it is true! In life, I have had the knowledge to do some amazing things but I never took advantage of the things that mattered. So, watching this again has opened my eyes to the need for me to execute more than I have in my past. I’d recommend you do the same. What does happy have to do with anything? Everything! I have recently completed the “7 Day Shadow Challenge” and this is the main reason why! Getting back to focusing on “Happiness”. I’ll tell you, after 7 days of unplugging and focusing on yourself, you’d be amazed at the mental state you will be in. We can live our whole lifetime without ever being truly awake. There are a lot of meanings people can pull from this lesson. The main thing to look into is the truth. Whatever it may be, the truth is a must to focus on. Service to Others! – There is no higher purpose! It is never about you! Regardless if you are starting a business or going to your job, the main thing that you need to focus on is your service to others. Stop gathering information from outside of you and start gathering it from within. People are not their thoughts, they think they are and that causes stress and depression. Your mind is just a reflex organ, it reacts to everything. Keep this in front of your mind as you go through life. There is nothing that you do that doesn’t involve your mind. That being said, remember you need to train your mind to react the right way to the things you face in life. Life is all about developing the wisdom to apply the right leverage at the right time and place. It’s like a phone book. You can watch people like the “Power Team”, a group of bodybuilders who do different things like tearing phone books in half to deliver the word of God. You think it is so hard. But with the right knowledge, if you apply the right leverage, anyone can do. The Present- Devoted 100% to the experience you are having at that single moment. So the main message of the movie is based on this. Being 100% in the present. I can spend a lot of time going into this but I’d recommend that you read “The Present” by Spencer Johnson M.D. or grab the audiobook. This is one of my favorite scenes in the movie. Regardless of what you are doing or where you are you have to understand that there is always something going on. The sun shining on the trees, the grass growing, your dog laying on the ground dreaming, pay attention to EVERYTHING! I will cover more in the “Take out the trash” part later on. I want you to understand how amazing everything is in life. First off, your heart beats right now without you having to think about it. You breathe without assistance. The sun heats the earth and gives us light. We have electricity, where we can flip a switch in our house and have a light come on or cook our dinner. This is something that has been weighing heavy to me over the last few weeks. Sometimes you have to drop and hit rock bottom before you can start growing in the direction you need to be. There are a lot of different messages scattered throughout this movie and I don’t want to somewhat repeat the same thing over and over. So here are a few other quotes from the peaceful warrior movie. Learn to meditate in every action. All you have is Right Now! This may be a scary moment for you! But, are you paying attention to it? First Realization of a warrior – not knowing. Everything has a purpose and it’s up to you to find it! Find your answers from within. You will never be better, the same way you will never be less than anyone else. There is no starting or stopping just doing! Now aside from all those, there are three main scenes that pack very strong lessons in them. You may or may not understand them at this time but if you find yourself thinking about this post in the near future come back to it and read it again… you may find that it means more later! – Take out the trash! The trash is anything that is keeping you from the one thing that matters… Here and Now! And, when you are in the Here and Now you will be amazed at what you can do and how good you can do it! – You Don’t surrender your dreams, You surrender the one thing you never have and never will…Control … Accept the fact that you can’t control what truly happens. -Humor – Keep a sense of humor especially about yourself! It is a strength beyond measure! -Change – Know that nothing stays the same! I have the DVD, which is hard to find at times but, Amazon usually always has it. The Journey is what brings us “Happiness” … Not the Destination! I hope this helps you in life. Please watch the movie and put the lessons in it to work in your life. Have yourself a blessed day!